The days of living by fashion rules are over! Labor Day means a few things: Three day weekend; kids go back to school; and goodbye to white clothes? As we know, there are so many fashion rules. Which ones do we follow? Which ones should we ignore? Don’t wear socks with sandals. You should match your bags to your shoes. Horizontal stripes make you look bigger. Red Lipstick is for the evening only. Don’t mix gold and silver jewelry. You can’t wear white after Labor Day. There are several theories about the origin of this fashion faux pas. Historians, anthropologists, and manner experts have debating theories, so it’s truly difficult to find the absolute truth, but we will discuss a few of the more popular. At the turn of the century, American fashion was dictated by those living in the cities of the Northeast, where there are seasonal changes. As the summer approached, the wealthy would leave the urban cities for summer homes. This was a way for them to distinguish themselves from the working class or even the nouveau riche. Those who stayed in the cities and kept working blue collar jobs wore darker palettes, whereas the wealthy wore their summer white. “If you look at any photograph of any city in America in the 1930s, you’ll see people in dark clothes”, says Charlie Scheips (American Fashion). It’s safe to assume that the people in these images represent the working class. Scheips adds that the white linen suits and Panama hats at snooty resorts were a “look of leisure.” After Labor Day, the wealthy would return to the cities dress in the dark colors appropriate for the filth of city life..
Others have attributed the wearing of white in summer to the simplicity of a fabric color that is comfortable in July/August heat. At the turn of the century, American society still dressed in formalwear exclusively. Men would be in suits, and women would be in dresses. Gloves were common to both genders at all times of the year. Since formal dress was very much a part of everyday-life, lighter weight, white clothes made more sense for the summer heat. In those days, wearing white would have been one of the few ways to keep cooler. This was not only before “casual dress” was normalized; it was also before the mini-skirt and halter top were invented. Labor Day became a federal holiday in 1894, and society eventually adopted it as the endpoint for summer fashion. Even though September can still be a time of extreme, uncomfortable heat, since then the wearing white in the last three weeks of summer has been looked down upon. Still, others believe this “rule” originated in fashion magazines. After Labor Day, they would promote the new Fall fashions, and as a result, the fashion elite would dismiss their summer whites for the new, darker tones seen in the pages of Vogue and Harper’s Bazaar. Well over a century after the first Labor Day, fashion rules are habitually disregarded in 2018. It is now acceptable, for example, for men to wear skirts and dresses. Beaded dresses are now acceptable day-wear for women. Clothing that would be considered private some time ago, like pajamas and athleisure wear, don’t cause anyone to bat an eye. And, of course, people wear white after Labor Day all the time now. We chose some white looks which we feel can be easily adapted for everyday. 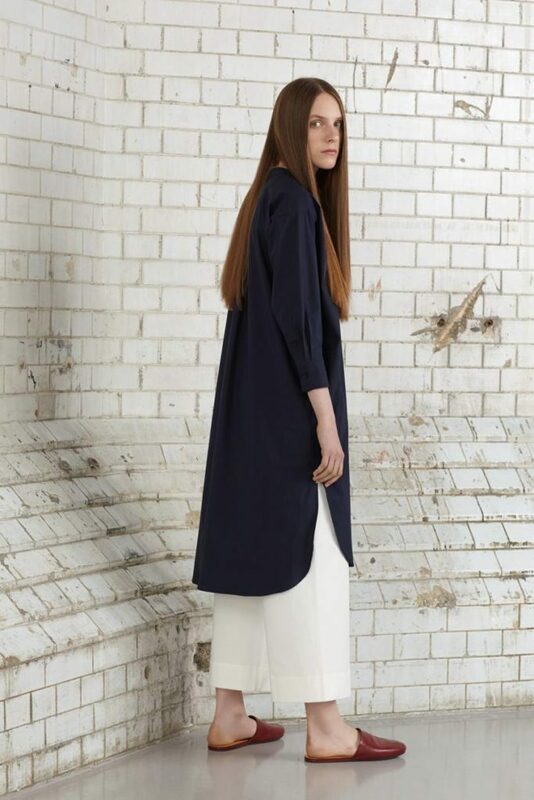 White trousers look great in the early autumn months with a black, shirt dress or a basic, black t-shirt and black overcoat. 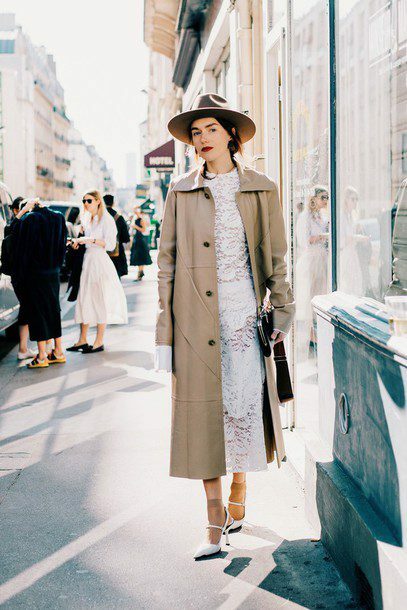 White dresses can easily transition into fall with a classic, camel trench, or coat. And, when it comes to hair, going darker for the Fall season isn’t a requirement. 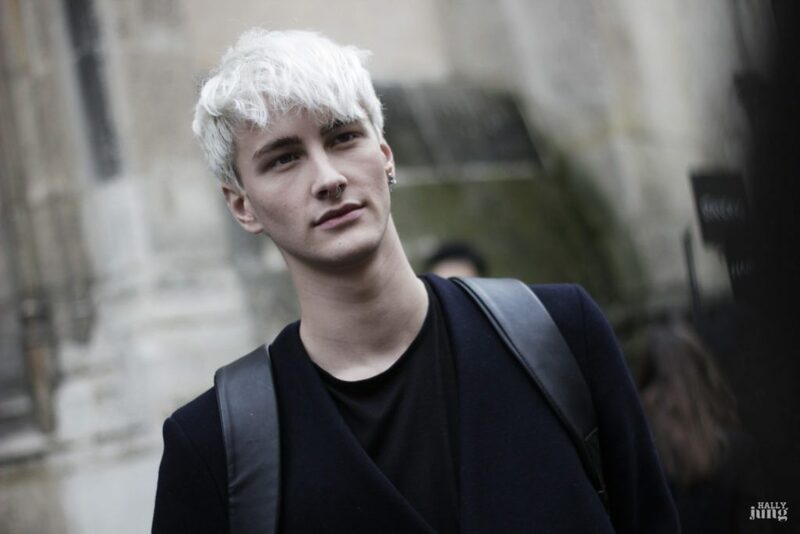 Platinum blondes (or white hair) looks great with all the darker coats and sweaters around the face. It’s a beautiful contrast in texture and color.